Diary of a Pro-life Girl: Censorship? Recently, a story spread like wildfire on Facebook - the story behind the photo below. 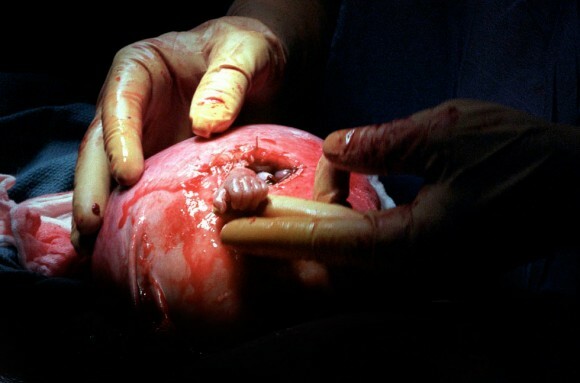 I'm sure all of you pro-lifers have seen the picture of Baby Samuel's surgery before, but many people haven't. One of my friends shared the story on Facebook, originally posted and written by someone else. About five minutes after I shared the photo, it had three likes, several comments, and three more shares. Everyone I talked to simply thought the picture was phenomenal, and were amazed that fetal surgery is even possible. You'd think this would be a pretty amazing story to share. Apparently, Facebook doesn't think so. The next morning I checked my Facebook and found that my fetal surgery post had disappeared. It was gone from all of my friends' pages as well. In fact, I couldn't find it anywhere. Facebook had taken it down. Since then I have heard that the story and photo were removed because of the "graphic content". "A picture began circulating in November. It should be "The Picture of the Year," or perhaps, "Picture of the Decade." It won't be. In fact, unless you obtained a copy of the paper, you probably will never see it. The picture is that of a 21-week-old unborn baby named Samuel Alexander Armas, who is being operated on by a surgeon named Joseph Bruner. The baby was diagnosed with spina bifida and would not survive if removed from his mother's womb. Little Samuel's mother, Julie Armas, is an obstetrics nurse in Atlanta. She knew of Dr. Bruner's remarkable surgical procedure. Practicing at Vanderbilt University Medical Center in Nashville, he performs these special operations while the baby is still in the womb. During the procedure, the doctor removes the uterus via C-section and makes a small incision to operate on the baby. During the surgery on little Samuel, the little guy reached his tiny, but fully developed, hand through the incision and firmly grasped the surgeon's finger. The photograph captures this amazing event with perfect clarity. The editors titled the picture, "Hand of Hope." The text explaining the picture begins, "The tiny hand of 21-week-old fetus Samuel Alexander Armas emerges from the mother's uterus to grasp the finger of Dr. Joseph Bruner as if thanking the doctor of the gift of life." She said, "The photo reminds us my pregnancy isn't about disability or an illness, its about a little person." You can see the actual picture, and it is awesome ... incredible. Pass it on.. the world needs to see this one." So, what do you think? Is this a case of censorship, or is the photo above really too graphic to have on a Facebook profile? I don't think it is too graphic...It is an image of healing, after all. I've shared this with Pro Life Pagans on Facebook, and it's also been tweeted. I think the story accompanying the picture is a bit weird. It makes it sound as if the picture is recent although the picture is almost twelve years old.